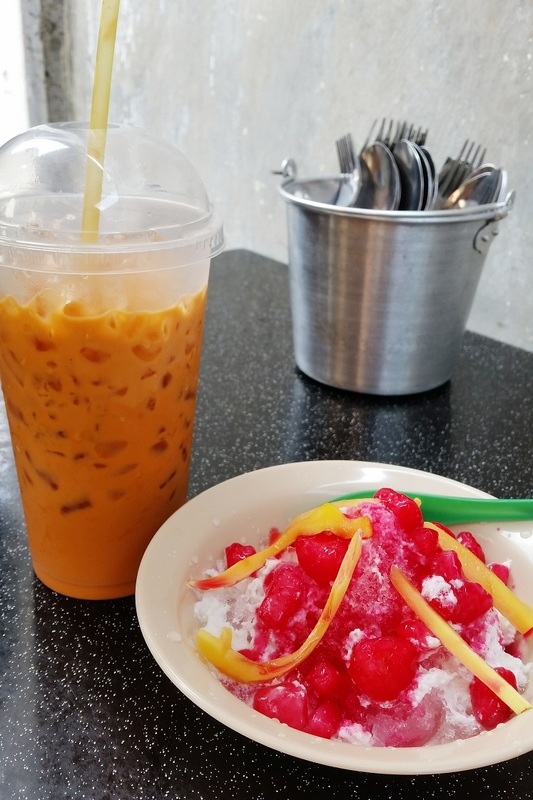 Thai Shop, a small cafe at the corner of Kimberly Street, is chock-full of Instagram-friendly nooks and crannies. 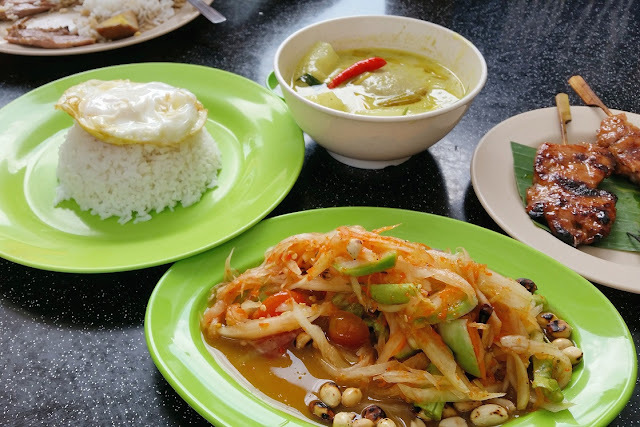 It offers authentic Thai cuisine with both indoor and outdoor seating. 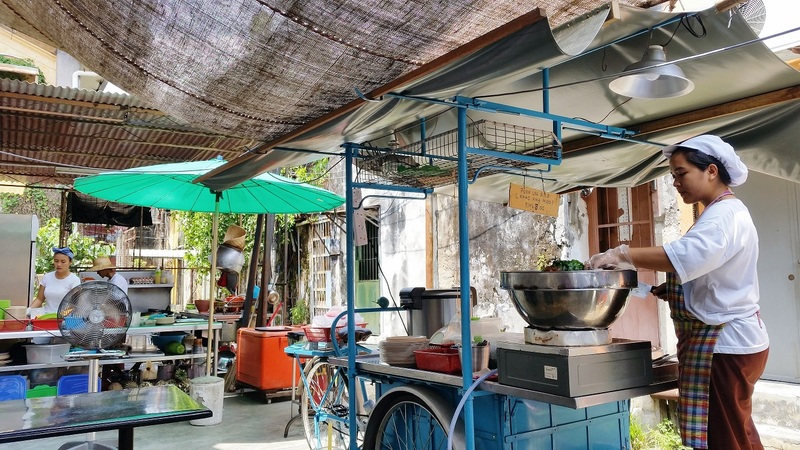 If the weather is good, grab a chance to sit outdoors to experience a full Thai street food experience. 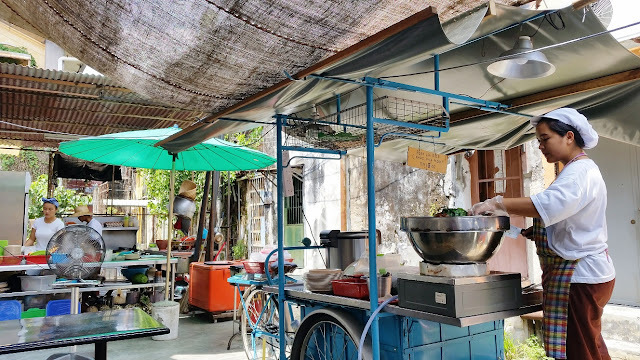 Ordering is slightly confusing; even if you're seated indoors, you still need to walk outside next to the little alley to place your order though don't let that deter you: the food here is amazing. 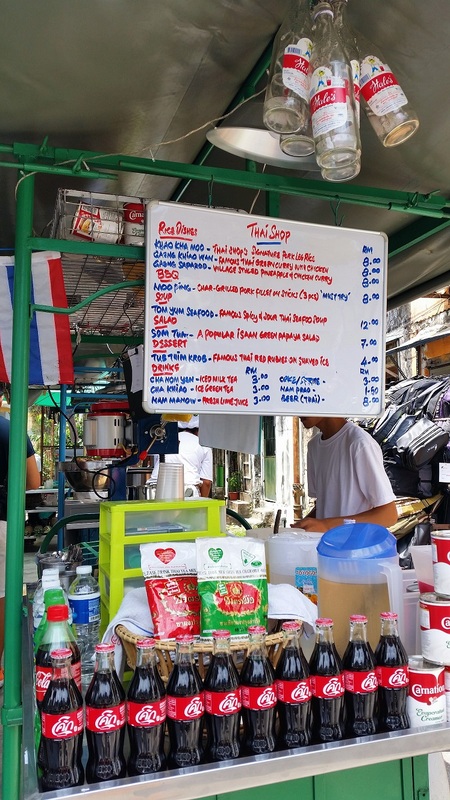 The menu is displayed in front of the drinks cart with a basic range of mains. The only sign that you're actually in Penang is that prices are in RM, not Baht ;) Even the radio is tuned into a Thai music station. 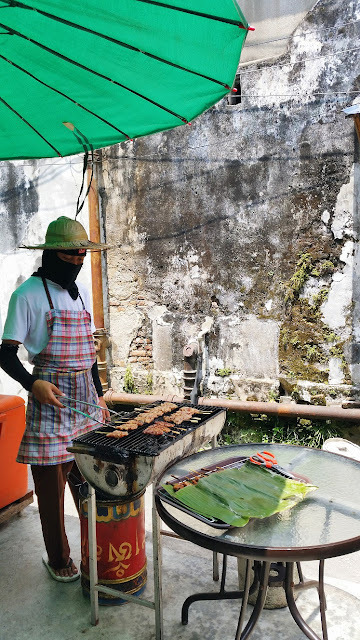 Staff were bustling around preparing food. The aroma wafting over from the grilled pork was incredible. The cha yen (Thai iced milk tea) and tub tim krob (shaved ice dessert) were the first to arrive. We loved the creamy, not overly sweet milky iced tea that comes in a ready to takeaway cup but thought that the tub tim krob could be more generous with their slices of jackfruit. 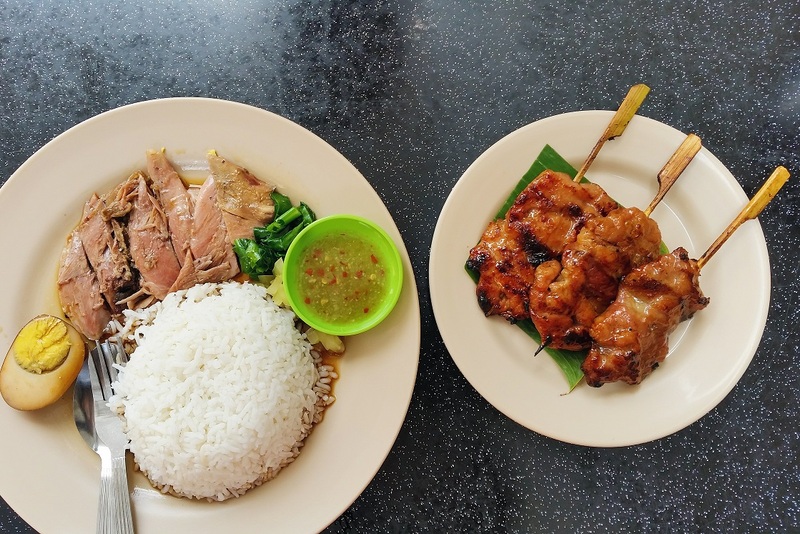 The pork satay was an instant crowd pleaser; succulent and sweet - almost like char siew, Bubs could have easily finished the whole plate if we didn't stop him. In fact, when Hubs returned again with his colleagues, he said one guy ate 7 sticks at a go and even requested a takeaway. It was THAT good. Hubs thought the signature stewed pork knuckle served with steaming white rice was tender and and reasonably priced. The pickles and chilli sauce went perfectly with the soft pieces of meat. 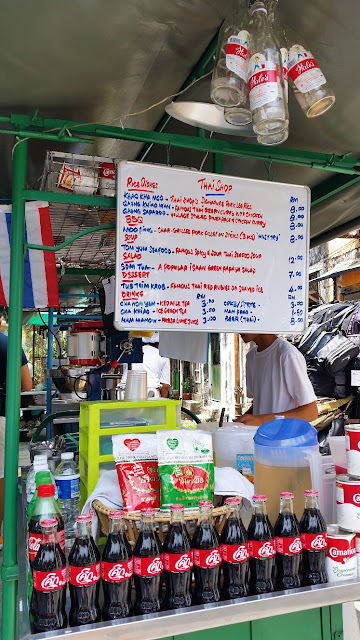 I liked the green papaya salad which was freshly made at the open air kitchen and it wasn't as crazily spicy as some versions I've had. It made for a light bite. I did think that they made a kickass fried egg for the rice that comes with the green curry. The green curry was decent though not the star of the meal. We loved the food there so much that we went back for round 2 with my Dad. This time around, we decided to add on a couple more items. 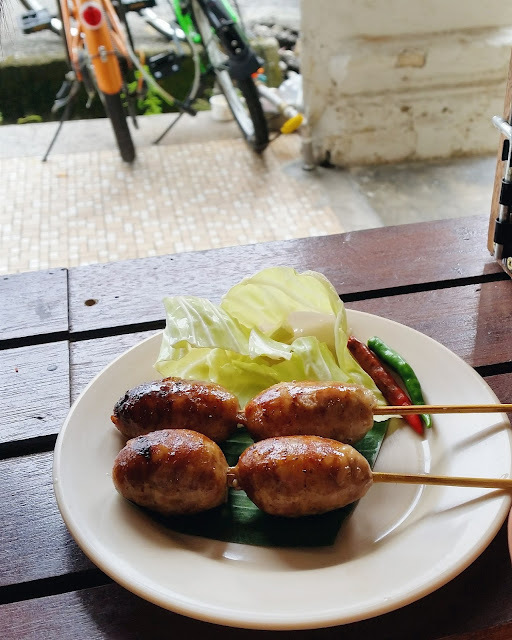 The pork sausages are a new addition to their menu and are a bit of an acquired taste. The owner told us in advance that it tastes a lil tangy. It wasn't that sour on the tastebuds but still pales in comparison to their stellar pork satay. Hubs was left to finish this since Bubs and I really loved the satay. 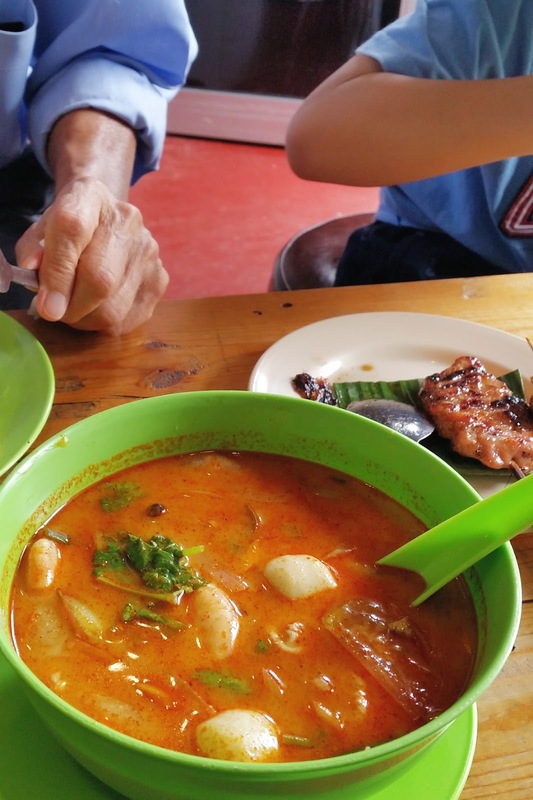 The seafood tomyum was a decent value, priced at RM12, it came with 3 large, fresh prawns. The fiery spice levels were more muted than I expected it to be and it wasn't overly sour either, though the flavours were bold and zingy.